On a basic level, feeding (viz. eating) is regulated by opponent pathways: for example the hormone leptin is anorexigenic (prevents feeding), whereas cannabinoids are orexigenic (causes feeding); in the lateral hypothalamus, AGRP-expressing neurons are orexigenic, while POMC neurons are anorexigenic. Many of the players in feeding regulation are known, and the current task in the field is tying them together into a coherent whole. Last month, the Sternson lab published a tour de force paper which takes a step forward in this direction, which I will cover here. Two groups of neurons in the arcuate nucleus of the hypothalamus play essential, and opposing roles in regulating food intake. POMC-expressing neurons activate anorexigenic pathways, and are stimulated by leptin. The anorexigenic nature of these neurons can be seen from selective ablation of POMC neurons via diptheria toxin, which causes an increase in body weight and food intake. Furthermore, stimulation of POMC-ChR2 neurons causes a decrease in feeding. Multiple lines of evidence connect POMC neurons to leptin: bath application of leptin depolarizes POMC neurons; and selective leptin-receptor knockouts in POMC neurons causes increases in weight. Selective ablation of neurons causes weight changes. c. Ablation of POMC-expressing neurons via diptheria-toxin causes an increase in weight. a. Ablation of AgRP neurons causes starvation. From Gropp et al, 2005. In contrast to POMC neurons, AgRP neurons are orexigenic. Slice work has shown that AgRP neurons inhibit POMC neurons via GABA release. 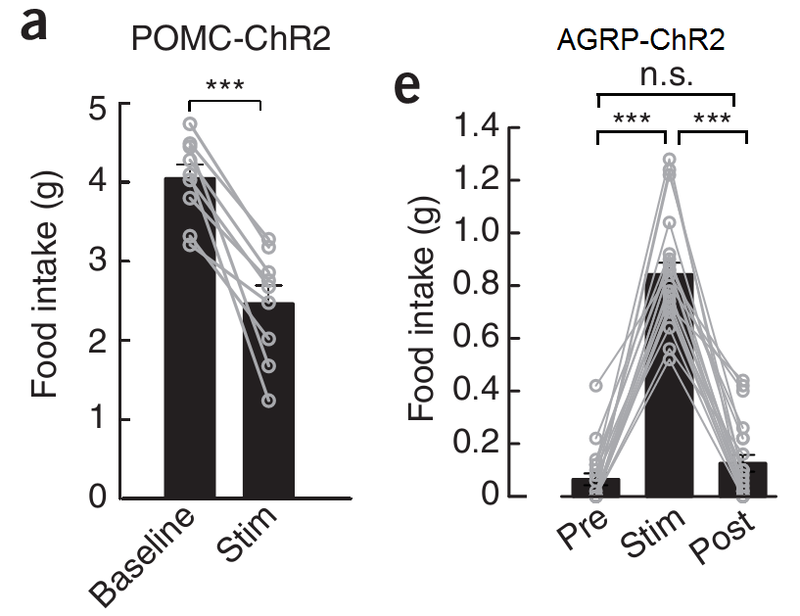 AgRP neurons' orexigenic nature has been shown by ablation of AgRP neurons via diptheria toxin, which causes anorexia, and by stimulation of AgRP-ChR2 neurons, which causes obesity. Channelrhodopsin stimulation of arcuate neurons changes food intake. 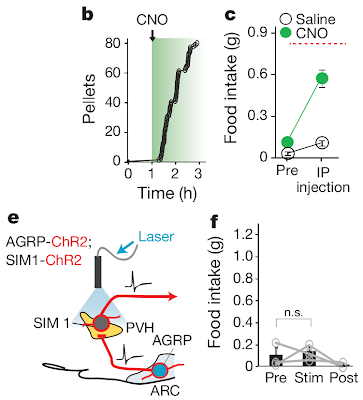 a. Stimulation of POMC-ChR2 neurons decreases food intake. 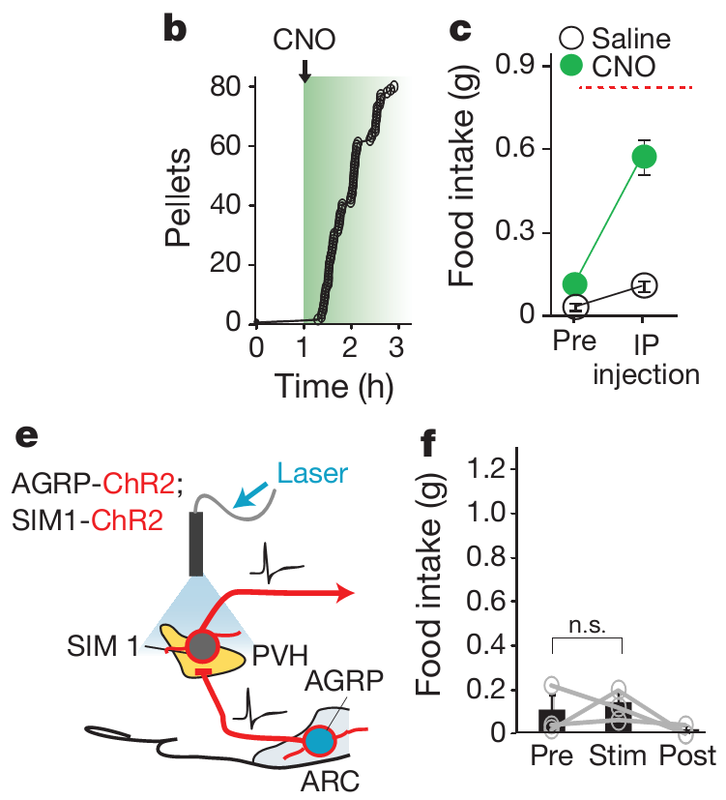 e. In contrast, stimulation of AGRP-ChR2 neurons causes an increase in food intake. From Aponte et al, 2011. POMC and AgRP neurons project to a few downstream nuclei, but of interest for this paper are AgRP neurons' projections to the paraventricular hypothalamus (PVH), and the parabrachial nucleus (PBN). I don't know much about PVH, but the PBN is the 2nd relay in the taste circuit. A series of papers from the Palmiter lab have implicated that PBN projection is important: in AgRP diptheria toxin mice, you can prevent starvation by implanting a cannula in the PBN that releases GABA agonists. There are many more players in food intake, including NPY, melanocortin, ghrelin, cannabinoids, dopamine, insulin, and many more. If you'd like to know more, I recommend this solid (but aging) review from Morton. All you need to know for this paper is that AgRP and POMC neurons perform opposing functions in the taste circuit. The main thrust of this paper is trying to understand how AgRP neurons can regulate feeding through their projections using a variety of transgenic, viral, and optogenetic techniques. This paper has 6 main figures, and 15(!?) supplemental figures, so I will only be highlighting the main points. First, they investigated how AgRP and POMC neurons interact, advancing previous work by using optogenetics. They cut slices in AgRP-ChR2 and POMC-ChR2 mice, and patched these cells to see how they were connected. As reported previously, they found that AgRP neurons have GABAergic projections onto POMC neurons. However, there was no reciprocal POMC->AgRP connection, nor any AgRP->AgRP or POMC->POMC connections. Since AgRP can inhibit POMC neurons, they wondered whether the silencing of POMC neurons alone is able to influence feeding. To silence POMC neurons, they used POMC-hM4D mice. If you are unfamiliar with hM4D, it is an artificially developed GPCR that is activated by a molecule called CNO, and reversibly silences neurons. When they gave the POMC-hM4D mice CNO, the mice did not gain weight like diptheria toxin mice (or at least not statistically significantly in 8 mice). Stastitical significance aside, it appeared that inhibition of POMC alone is not able to drive feeding, and thus AgRP probably works primarily through other pathways. As a final step to investigate the interplay between AgRP and POMC, they used double transgenic, AGRP-ChR2/POMC-ChR2 mice, and stimulated both groups of neurons simultaneously. These mice increased their food intake, showing: 1. that AgRP activity can dominate POMC activity; and 2. that POMC inhibition is not necessary for increased food intake. From this initial set of experiments, they conclude that AgRP neurons do not primarily work via inhibiting POMC neurons. Stimulation of both AGRP and POMC neurons leads to an increase in feeding. left. Diagram of activated neurons. i. Pellet intake during light stimulation. j. Food intake increases during stimulation of both AgRP and POMC neurons. From Atasoy et al, 2012. 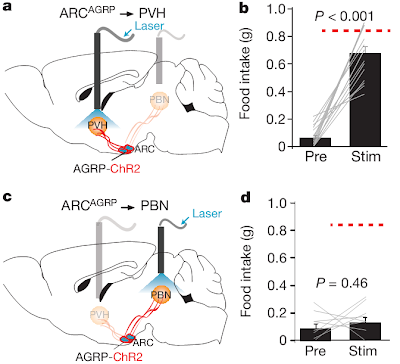 To look at AgRP neurons' effects on PVH and PBN, they once again used AGRP-ChR2 mice, but instead of implanting the light fibre over the hypothalamus, they put the fibre over the axons in the PVH and PBN. When they stimulated AgRP axons in PVH, they saw an increase in food intake, showing that AgRP->PVH activity is sufficient. However, when they stimulated the AgRP fibres in the PBN, they did not see an increase in food intake. Thus, of AgRP neurons' three possible targets, they hypothesized that their PVH projection is most important for food intake. Stimulation of AgRP fibres in PVH is sufficient to increase food intake. top. Experimental setup and food intake for PVH stimulation. bottom. Experimental setup and food intake for PBN stimulation. From Atasoy et al 2012. Having identified PVH as important, they homed in on it. First, they explored the AgRP-PVH connection in slices, and found that there is indeed strong inhibitory input from AgRP to PVH. Then, to see whether PVH inhibition is sufficient to induce feeding, they expressed hM4D throughout PVH by using the SIM1 promoter (SIM1-hM4d). Upon administration of CNO, these mice gained weight, showing that inhibition of PVH is sufficient. Since no one would believe a single silencing paradigm, they repeated the experiment using PSAM-GlyR, and saw the same effect. To show that PVH inhibition is necessary, they created AGRP-ChR2/SIM1-ChR2 mice, and stimulated both populations simultaneously, and this was not able to increase food intake. Thus, PVH activation can prevent AgRP-neuron induced feeding, and PVH inhibition is necessary for AgRP-neuron induced feeding. PVH inhibition is sufficient and necessary for increased food intake. b/c. In SIM1-hM4D mice, CNO administration causes increased feeding. e. Diagram of double stimulation experiment in AGRP-ChR2/SIM1-ChR2 mice. f. Double stimulation does not case an increase in feeding. From Atasoy et. al., 2012. The PVH contains multiple types of neurons, and of these, they decided to focus on the oxytocin (OXT) expressing neurons. They again performed the double stimulation protocol, this time in OXT-ChR2/AGRP-ChR2 mice, and again found that OXT neuron stimulation could prevent AgRP-neuron induced feeding. In the final set of experiments, they investigated whether AgRP neurons release neuropeptide Y (NPY) and GABA in the PVH. To do this, they implanted cannulas with pharmacological antagonists for each of these neurotransmitters in the PVH of AgRP-ChR2 mice. Blocking either neurotransmitter decreased the AgRP-ChR2 induced feeding, showing that both neurotransmitters are functional at the AgRP->PVH synpase. Phew! I told you that was a tour de force. By my count, they used eight(!) transgenic mouse lines, and five different viruses. They nonchalantly mentioned results that might be a starting point for a whole paper in a single sentence, "we have found that food deprivation increases inhibitory synaptic drive onto PVH neurons (Supplementary Fig. 12)." To be honest, the sheer magnitude of this paper kinda pissed me off, since the results could have come out sooner if the paper was split in two (yet more evidence of Nature's supplemental figure problem). This paper was received by Nature last September, accepted in May, and published in July; it took ten months for this to become public. Everyone's ok with this? Given the sheer number of experiments in the paper, I was somewhat disappointed by the two paragraph discussion. To be fair, this is probably due to the six page limit (which would explain the above mention of Sup. Fig. 12, and yet another reason to dislike journals). For example, as I mentioned in the background, there is evidence that AgRP neuron GABAergic signaling to the PBN is necessary for normal feeding. 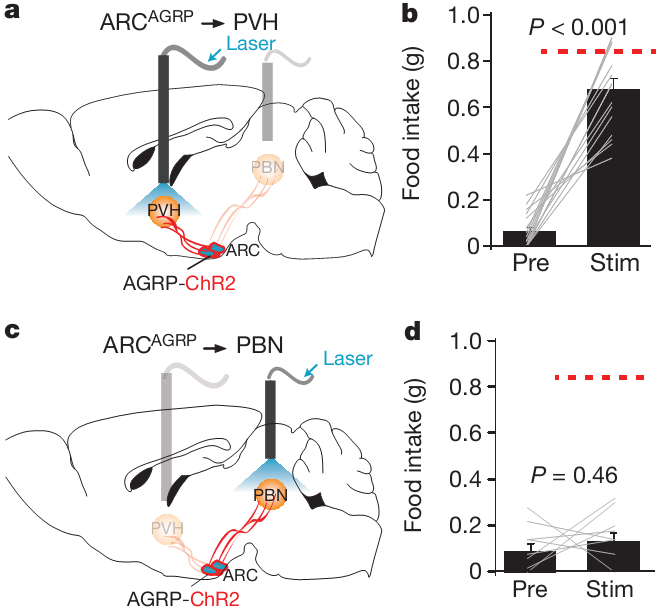 However, the PBN gets a single sentence in the discussion, "Finally, AGRP neuron projections targeting the parabrachial nucleus (PBN) in the hindbrain do not directly activate feeding, but instead they restrain visceral malaise that results from AGRP neuron ablation." Those Palmiter papers also investigated the PVH, and found that it was not important in their paradigm, so I would really like to have seen a more thorough exploration of the differences between the papers. 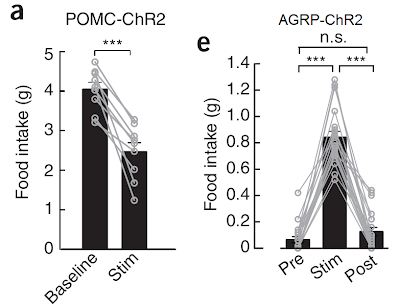 The most intriguing single experiment, to me, is the dual activation of both AgRP and POMC neuron populations, which implies that the orexigenic pathway is able to dominate the anorexigenic. If I may speculate, when humans talk about satiety, we range from hungry to sated to full. Hunger is a strong feeling, motivated by blood sugar levels (or something), while fullness seems more "visceral," governed by stomach distension. However, satiety is a rather subtle feeling, since it is the default (at least in the developed world). Perhaps the argument of origenic vs anorexigenic pathways is entirely wrong, and the actual opposition is between orexigenic and non-genic pathways. If provoked, we can feed while we're sated, but if we're full, stuffing more food in our face is nauseating. In any case, I look forward to their undoubtedly ongoing experiments looking at POMC's projections, and to see how those projections overlap (or not) with AgRP. While I know vanishingly little about oxytocin (I leave that to cognitive scientists), in the discussion they note that oxytocin disorders in humans can lead to "instiable hunger." What I find strange is that the body would transduce a straightforward satiety signal (leptin/cannabinoids) into another hormonal signal, oxytocin; unless, of course, oxytocin here is simply a neurotransmitter, and not an endocrine signal. Of interest to me is that oxytocin is expressed by the glial-like taste receptors on the tongue. While these glial-like cells do not have taste receptors themselves (the receptors are in the aptly named receptor cells), it is possible that oxytocin could indirectly modulate taste itself, similar to how leptin and cannabinoids can directly modulate sweetness.